Spain, which had acquired the Louisiana Territory from France in 1682, found itself in a crisis in the late 1700’s due to a failing economy in the North American territory. In an effort to bolster the economy with a reliable currency to finance foreign and local trade, Carolus III, The Bourbon King of Spain, ordered the near worthless paper money be redeemed with silver coinage from the Spanish Mint in Mexico. The King dispatched his most trusted captain, Gabriel de Campos y Pineda, to deliver approximately 450,000 Spanish reales to the port of New Orleans aboard the brig of war, El Cazador (meaning The Hunter in English). The ship sailed from Vera Cruz, Mexico on January 11, 1784, but never reached her final destination. The 2 Reales coin owned was certified by the Numismatic Guaranty Corporation (NGC). 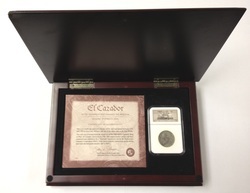 The coin is in a presentation box with a certificate of authenticity and a pamphlet that details the shipwreck.